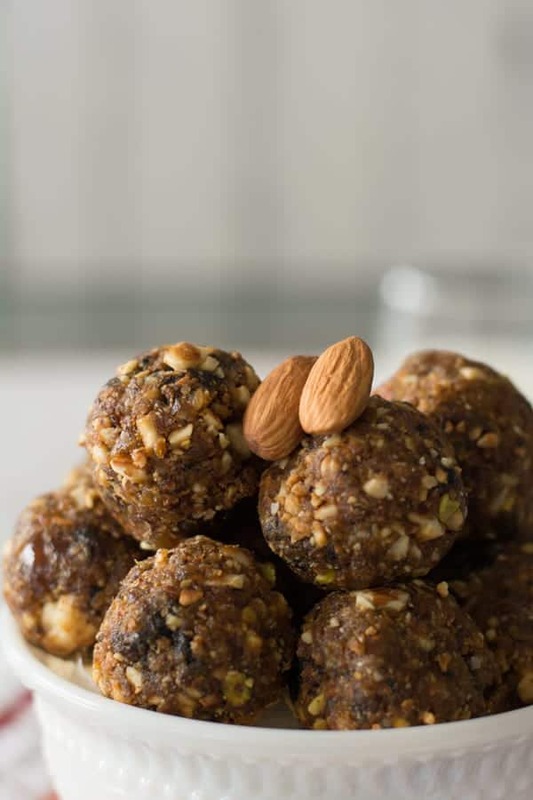 Dry fruit laddu is one of the amazing recipes to boost the energy with nature. It is a high energy snack best for the mid-day snack or evening snack. It’s an incredible feeling to eat right after the gym workouts and exercises. The ingredient added to this recipe is excellent for the muscles. Made with dates, apricots, fig, almonds, pistachios, and cashew. These ingredients are healthy, and great after any manual labor. Or could also be taken before any workouts to get your body to increase your energy levels and to use the stored energy when conducting physical exercises. One of the most amazing things about this dry fruit laddu is that it is it has a wide range of applications and could be amended to fit your daily needs. Now, it is the story time; it was about two years ago I had severe muscle aches along my spinal cord. I haven’t gone to such a bad state that the doctors recommended that I use pain relievers almost on a daily basis and sometimes even an hourly basis. So I so I started following this well reputable food nutritionist who’s also a doctor say is that what are the most important things when trying to resolve some body ache pain or disease is to First address if the cause of the problem. So the root cross for my problem was that I wasn’t taking in too much magnesium and needed vitamin and minerals. So I put on my thinking cap and experimented with different ingredients and different dishes. And finally, I arrived on if this dry fruit laddu. The reason why dry fruit laddu took so long and so many hours of hard work was so I wanted to make a dish that would be healthy and would also be tasty. See the problem with all the energy slash recovery dishes is that they’re either too kind and treated on a specific element like protein or carbohydrate or carbohydrates or vitamins or they taste like wet cardboard. I tried my hardest to to make the most healthiest that was also the most tastiest and I try to do all of this in the most naturalistic way possible. So I present to you this dry fruit laddu and I am waiting on your responses on how you like them. The ingredients I have added are dates, apricots, fig, almonds, pistachios, and cashew. But you can add your favorite dry fruit. But I would suggest keeping the dates to the maximum quantity. The other choices can be, dried berries, like strawberry, cranberry, blueberry, plums, etc. This laddu does taste great is the quantity of nuts, and dry fruits are of the same amount. The options for the nuts are also vast. You may seeds like, sunflower seeds, melon seeds, sesame seeds, and also add dried coconut slices. I have added brown sugar in this recipe, but you may add or skip the sugar. If you are feeling like adding sugar, then you may add refined sugar or any other natural sugar. And I have added cardamom powder, as it also has medicinal values. But you may also substitute with vanilla extract. It stayed great for one week over my kitchen counter. I did not store more than that period. I always make dry fruit laddu batches, by limiting the quantity of the ingredients. So I do not know, And according to my personal experience, it does stay good for one week in the room temperature. To make dry fruit laddu, we need nuts and dried fruits. For the nuts, I have added almonds, cashews, and pistachios. I have added almonds more, as my family likes a taste of almonds and moreover it is an excellent source of protein. In the food processor grind them coarsely. 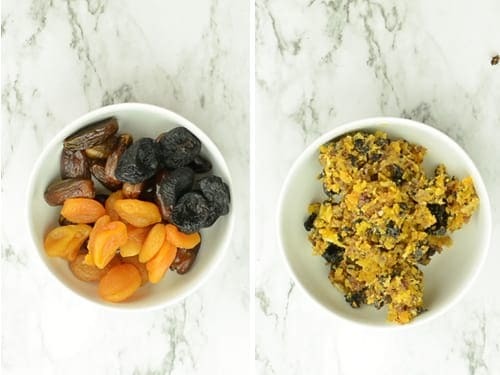 The dry fruits I have added are dates, apricots, and figs. But as I said earlier, you may add your favorite dry fruits. Grind them coarsely using the same food processor. 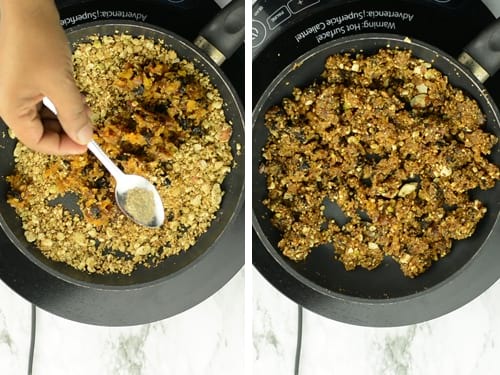 In a pan add 2 tbsp of ghee(clarified butter) and the ground nuts mixture. Saute them until it changes the color slightly. Then add sugar, which is optional. Here in this recipe, I have added brown sugar. But you may add refined sugar, or you may also skip adding sugar. Then add the ground dry fruit mixture, and cardamom powder. Then saute this laddu mixture again for a couple of minutes until everything blends together. Then remove it from the stove. Allow it to cool for about 10 minutes. Then start making laddu using your palm. Once the laddu cools down completely, transfer them to the airtight container. Dry fruit laddu is one of the easy recipe to boost the energy with the nature. It is an high energy snack best for mid day snack or evening snack. It's amazing to eat right after your gym workouts and exercises. 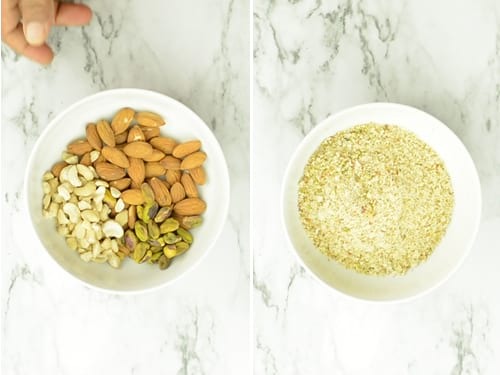 Grind almonds, cashews and pistachios coarsely. Then Grind dates, apricots and figs coarsely using the same food processor. In a pan add ghee(clarified butter), and the ground nuts mixture. Saute them until it changes the color slightly. Now add the ground dry fruit mixture, and cardamom powder. Then saute again for couple of minutes until everything blends together. Switch of the flame. Allow it to cool for about 10 minutes. Once the laddu cools down completely, transfer them to the air tight container. What an nutrition education you gave us today. I’ve looking for just such a snack food. Would have never thought of using cardamom powder. Sujatha, can you add the ingredient quanities for the recipe? Thanks for a great post. Yes, cardamom adds a fresh tropical flavor to these balls. Thanks Ron for letting me know that ingredient list is missing, I have updated it now.